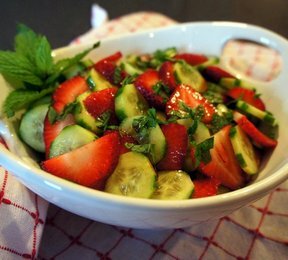 Whether you're making a strawberry shortcake recipe, strawberry jam, or even a refreshing strawberry smoothie, make preparation easy when creating your favorite strawberry recipes with RecipeTips.com's strawberry slicing, dicing, and mashing tips. 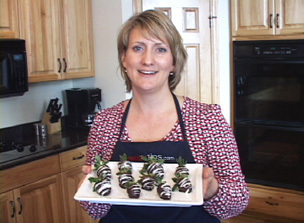 For more information on strawberries and preparation and recipes, visit RecipeTips.com. How you cut your strawberries depends on what you are going to be using them for. If you have a smaller strawberry and it is going to be used as a decorative strawberry, you may simply just want to cut the strawberry in half. 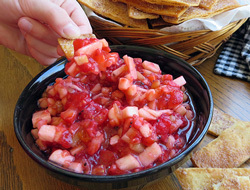 Now if you are using strawberries for a sauce or something that needs to be blended, and you have larger strawberries, go a head and place the strawberry core side down on the cutting board and cut it in half and lay those halves down so you can cut them in quarters easily. To slice strawberries, place them core side down on to a cutting board. Starting on one side begin slicing through the strawberry as evenly as possible. 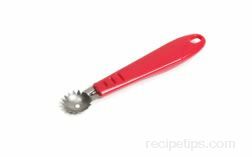 For a faster and simpler way to cut strawberries, use an egg slicer. 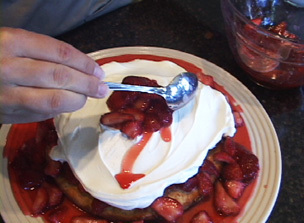 Open it up, place your strawberry into the egg slicer and gently press all the way through. You get nice evenly cut strawberries. 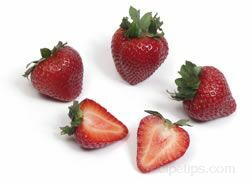 To dice a strawberry, begin with slicing your strawberry in half, place the cut side down on a cutting board, then slice it into 4 pieces. Now if it is a larger strawberry, you may want to slice it into 6 pieces. 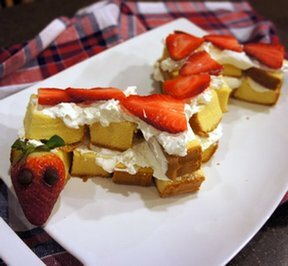 Keep the slices together, turn it sideways, and cut the strawberry into smaller pieces. 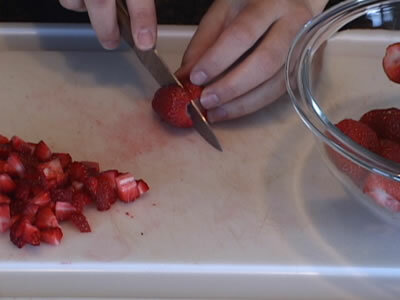 To mash strawberries, there are different tools that you can use. 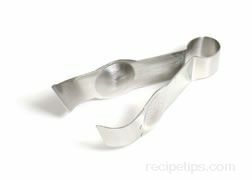 You can use a fork, a pastry blender, or potato masher. To begin with have your strawberries cleaned, stemmed, and quartered. 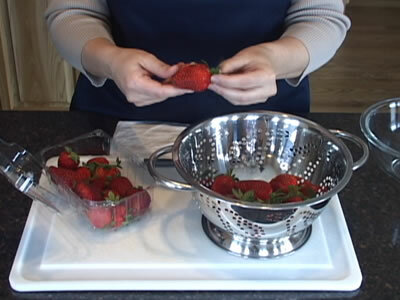 To use a fork, grab a hold of the fork down low so that you have more leverage and just begin to mash the strawberries using the side of the bowl to press against it. Now remember that the more you mash them the easier it is going to get because the juices are going to start flowing from the strawberries to make it easier to mash. Just continue to go until you have it to the consistency you wish. The second way is with a pastry blender. You have the leverage from the handle which makes it a little bit easier. Just go a head and begin to mash the strawberries all together. The third way is with the potato masher. 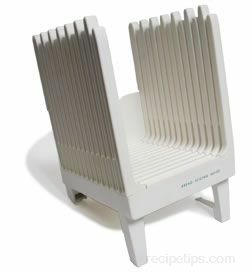 It works the same way as the pastry blender; just work the strawberries until you have them at the consistency you wish. Use whatever tool works best for you. I prefer the pastry blender. 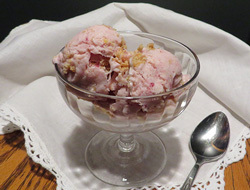 Just keep mashing your strawberries until you reach your desired consistency. Something else that works really good for this is a food processor but remember to only pulse a couple of times so you do not over process. 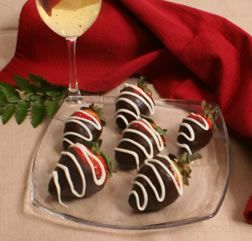 For more information on strawberries and to learn how to cook and prepare other fruits, visit RecipeTips.com.